Lately I’ve been employed on a part-time freelance basis by a company called Anarkik3D Ltd., based at Edinburgh College of Art. I re-did their web site so it’s easily maintainable, running on WordPress, but mostly I’ve been testing the new version of their 3D haptic modelling software package, Cloud9. I got into this because as a sculptor with an interest in computer graphics, I’d been wanting for years to try out a fully 3D, tactile interface for 3D modelling. Even in two dimensions the mouse is a poor interface tool for many things , most notably for drawing; no surprise, then, that it’s hopeless for sculpting. The 3D packages I’d used worked around this by using systems of 3D construction based on 2D views and interactions that bear almost no resemblance to sculpting at all, compensating for the inadequacy of the physical interface with elaborate systems for controlling every detail of what you’re trying to create. I’ve used less sterile packages since then, but they’ve still never felt anything much like sculpting. Cloud9 works with hardware allowing 3D interactions with 3D models, enhanced by the sense of touch (which is what ‘haptic’ means). You move the controller around in space, and when you touch a virtual object, you can feel that it’s there. It’s designed to be intuitive to use, and it’s a far cry from the technical sophistication and precision of many 3D packages, partly because the creators have self-consciously made it ‘un-CAD-like’, aiming for such a gentle learning curve that artists and designers can sit down with little or no training and start making things right away. On the whole I think it does a good job of achieving what it sets out to. 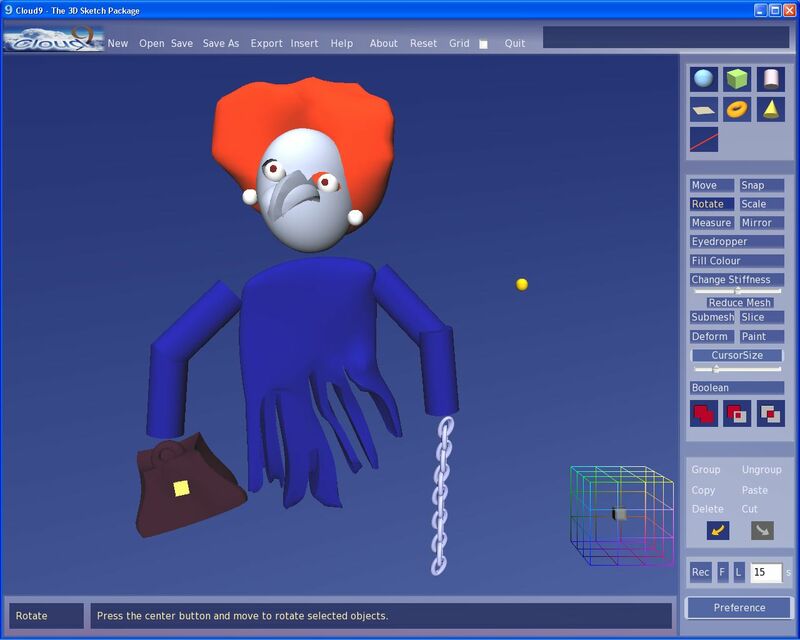 The software is limited in various ways – it doesn’t allow you to control lighting, for one thing, and textures are limited to flat colours – but then, it is quite possible to create something in Cloud9 and then import it into Maya, Blender or whatever to do that stuff. Hopefully more of it will be included in future versions, though there is obviously a fine balance to be kept between adding features and keeping it simple. Some of the most interesting possibilities of Cloud9 involve 3D printing of objects created – both company founder Ann Marie Shillito and student Farah Bandookwala have been creating some interesting jewellery this way. For my part I am equally intrigued by the prospect of combining this with 3D scanning to allow the physical sculpting of 3D creations which are then imported into a computer for further enhancement. 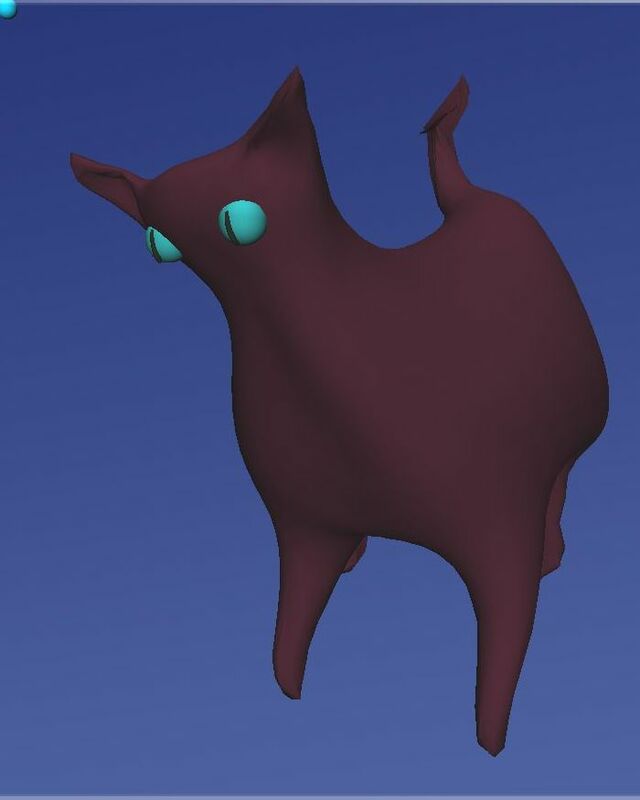 Here is a screenshot of a cat I made with Cloud9, because cats are my sculptural ‘Hello World’ examples – the thing I make when I want to be sure I’ve got some kind of handle on a new medium. 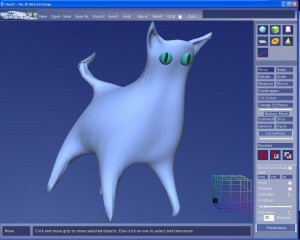 Making this involved creating a sphere and then deforming it bit by bit in 3D to make it more cat-shaped. 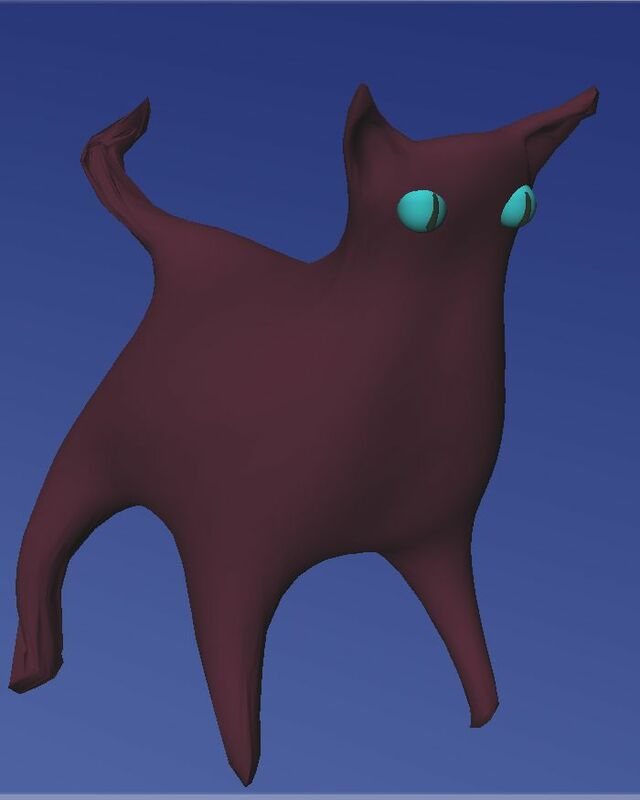 The amount an object can be deformed is limited by the number of triangles that make it up, so I had to periodically use the ‘Sub-Mesh’ function to add more. 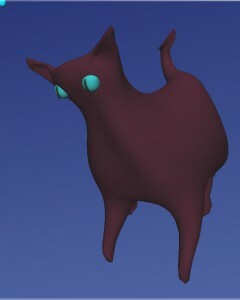 Below is a sort of rough 3D sketch for a giant puppet I’m planning. This was fun to make, and some bits at least were easier than making a physical version, even a small one. I’d already drawn a bunch of sketches on paper – not something I often do – but it’s great being able to see it from different sides, and so on.